An incident in January 2017 in which a Challenger business jet was severely damaged after flying into wake turbulence from a Sydney-bound Airbus A380 focused attention on what can happen when large and small aircraft share the same airspace. One passenger in the Challenger was seriously injured and several others hospitalised. The aircraft, which had been flying at flight level 340, rolled at least three times, lost about 10,000 ft and flamed out before making an emergency landing in Muscat. The damage was so severe the aircraft was written off. On 14 September 2012, a Virgin Australia Boeing 737-800, en route from Denpasar to Brisbane, encountered wake turbulence south of Bali from an A380 travelling in the opposite direction 1000 ft above, about 2 nm behind, and slightly left of the Boeing’s track. The aircraft rolled initially to the right, then to the left, with a maximum left-bank angle of about 40 degrees. On 16 October 2011 over Germany, a westbound British Airways A320 on climb from FL320 encountered severe wake turbulence from an eastbound Qantas A380 at FL330. The A320 was subjected to forces of up to +1.93G and rolled between -26 degrees and +32 degrees. Four passengers suffered minor injuries. On 3 November 2008, the crew of a Rex Saab 340B reported a temporary loss of control while about 7 nm from touchdown and turning onto final approach for runway 34R at Sydney. The Saab rolled 52 degrees to the left, then 21 degrees right, pitched down 8 degrees and lost between 300–400 ft in altitude. One person suffered minor injuries. The Australian Transport Safety Bureau (ATSB) found that the cause was wake turbulence which had drifted in a westerly crosswind from an A380 operating about 3.4 nm ahead on the parallel runway 34L. The ATSB calculated that with winds of about 35 knots at 2400 ft, the A380’s wing vortexes took 72 seconds to cover 1300 metres. There have also been numerous wake turbulence events involving aircraft of different sizes, so this is a topical issue for all aviation operations in Australia. Wake turbulence is an inevitable by-product of flight. It’s the result of differential pressure between the upper and lower surfaces of a fixed or rotating aerofoil. The turbulence is caused by the roll up of airflow behind the wingtips, creating a clockwise vortex behind the left wingtip and an anticlockwise one behind the right wingtip. The vortexes are generated the whole time an aircraft is airborne. While generally only a few metres in diameter, they can be very intense, depending on the aircraft’s weight, wingspan, configuration and attitude. Size really does matter, though there are exceptions; some aircraft, such as the Boeing 757, have a reputation for producing particularly intense vortexes. What makes wake vortexes particularly dangerous is that they can persist some distance behind, and below, the aircraft generating them. En route, an aircraft’s wake can extend for more than 25 nm, and descend very slowly downwards and outwards—levelling off around 1000 ft below the generating aircraft. This means encounters can occur when an aircraft passes below the flight path of another aircraft—even though ATC vertical separation is being applied. In the terminal environment, the concentration of aircraft of different sizes increases the risk of exposure to wake vortexes. This all means pilots have to be keenly aware of wake turbulence in all stages of flight. Helicopters in forward flight produce wake turbulence as well, so the advice in this article is equally applicable when operating behind a larger helicopter. What should pilots do in a wake turbulence encounter? The downward or upward force from a wake turbulence vortex is likely to cause a following aircraft to initially roll in one direction. The natural reaction is to try to counter the roll with opposite aileron and rudder. Counterintuitively, however, this is likely to make matters worse. This is because as the aircraft enters the vortex, it is likely to experience a stronger roll in the direction of the vortex—opposite to that encountered initially. This second roll would be amplified by any force applied by the pilots to correct the initial roll. It is thought that such overcorrection contributed to the severity of the A380/Challenger encounter. Some aircraft flight manuals contain procedures to be followed in wake turbulence. In the absence of specific procedures, the advice is to avoid abrupt reverse control inputs, and instead allow the aircraft to pass through the vortex and then recover. In particular, pilots should not use rudder to counteract the effects of wake turbulence, because this can create forces beyond the aircraft’s structural limits. The advice is also to leave the autopilot engaged, but be ready to resume manual control if it disengages itself. What should pilots do to avoid wake turbulence upset? 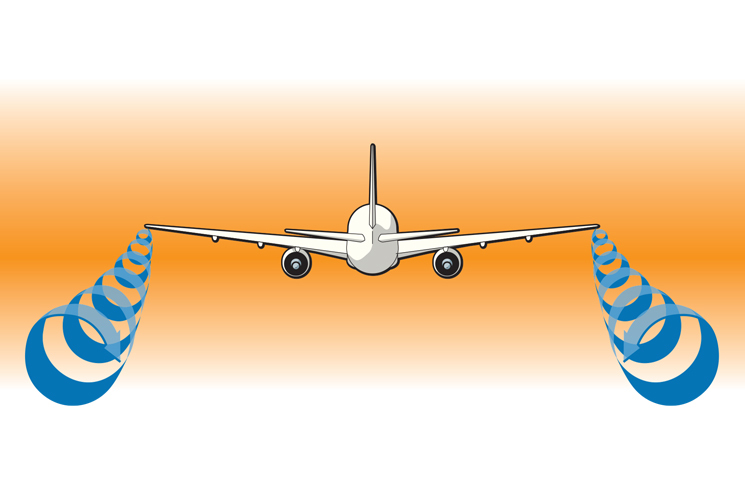 The most obvious solution is to avoid the vortexes from another aircraft in the first place. En route, you can offset from the route centreline—obtaining, if appropriate, ATC clearance or request a level change. But be aware vortexes drift with the prevailing wind, so offsetting on the wrong side can make things worse rather than better. Try to visualise any lateral movement of the wake vortexes as a result of wind and make your decision accordingly. Contrails from the aircraft ahead can assist in this regard. In controlled airspace or at controlled aerodromes, air traffic controllers will apply wake turbulence separation between instrument flight rules (IFR) aircraft in flight and, for take-offs, between all aircraft—IFR or visual flight rules (VFR). 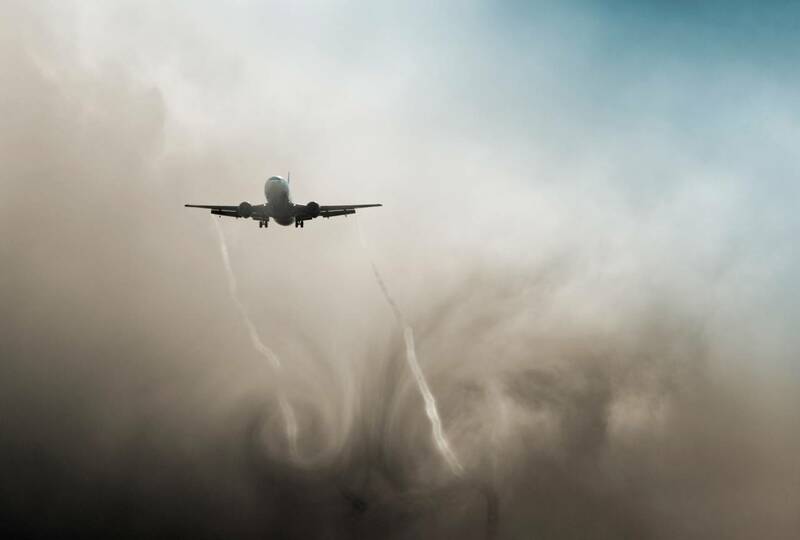 Be aware that ATC wake turbulence separation does not enable an aircraft to completely avoid the effects of wake turbulence; it only mitigates the worst effects. However, if the pilot of an IFR flight accepts a clearance to visually follow a preceding aircraft, the pilot is responsible for both separation and wake turbulence avoidance. Controllers will provide a wake turbulence cautionary advice to all controlled flights if, in the controller’s opinion, wake turbulence may have an adverse effect. if unsure on final approach—going around and making another approach. A hovering or slow hover-taxiing helicopter generates a downwash from its main rotor(s) that can be powerful and dangerous. Pilots of light aircraft, even when taxiing, should avoid operating within three rotor diameters of any helicopter in a slow hover taxi or stationary hover. SY Airport I believe is an accident waiting to happen especially when RWY 34L & 34R are in use. Besides the SAAB mentioned above there has also been A Dash 8 and late last year A J32 lost total control briefly on approach 34R going through 1000AGL not recovering until about 800AGL; an A330 was on RWY 34L; an ATSB report submitted with no response! 3. A strong westerly wind component at 1000 ft. which would/could course the wake of aircraft on runway 34L to drift across into the paths of aircraft on runway 34R. Good information, but incomplete. 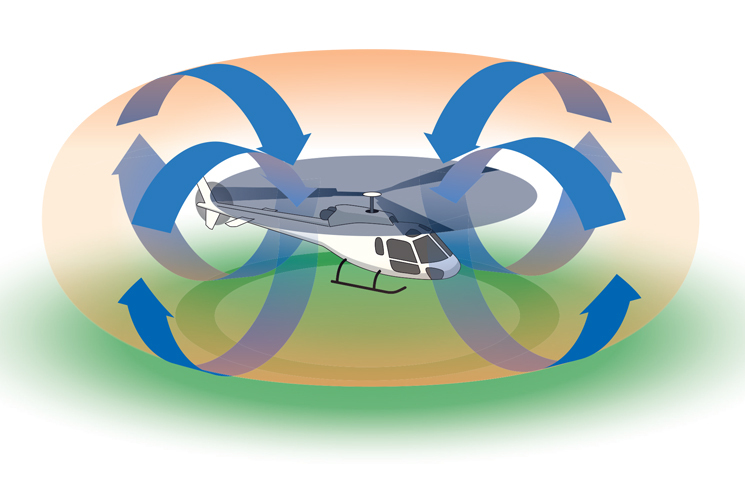 Helicopters of any size produce wake vortices while hover taxiing, climbing, hovering, or at any other instance when rotors are producing lift. Light aircraft, such as single engine Cessnas can be blown over when a light helicopter air taxis nearby. Youtube has an interesting video of a Cirrus that encountered wake turbulence from a departing Blackhawk ith tragic results. While wingtip vortices from landing or departing light aircraft don’t produce nearly as much as even a small jet (or a helicopter), wake turbulence as been identified as the culprit in several formation landing accidents in the US.